On Monday August 14, Justin Okonoboh lost his job as the Speaker of the Edo State House of Assembly. I watched part of the proceedings where the Right Honourable Speaker was roughed up as one of the members pushed him out of his chair. This event happened on the 99th day since our dear President Muhammadu Buhari travelled out of Nigeria on medical tourism. Okonoboh shared the same fate with his predecessor, Victor Edoroh, was also removed last year. 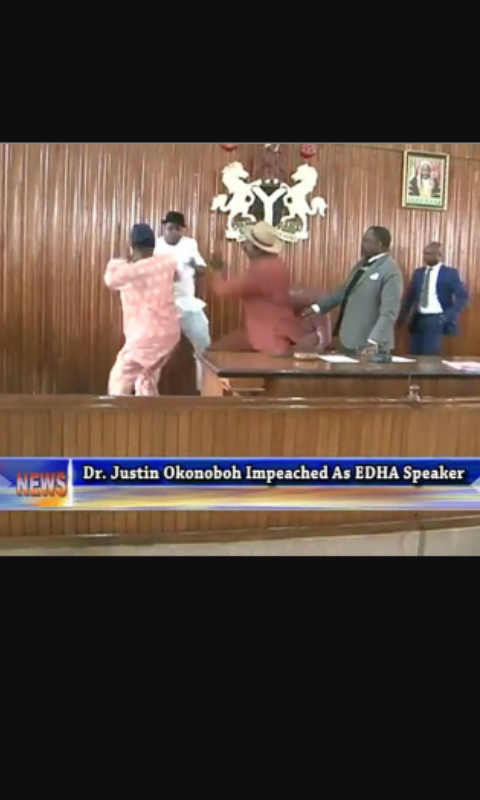 Though they threw some punches, none of the Honourable members ended in the hospital or the mortuary as it once happed in the National Assembly. By our laws, whatever a member does on the floor of the House is outside the ambit of the law. He is fully immune from prosecution for both verbal and physical assault. Once in Ibadan, during the Western Regional crisis in the 1960s, one of the members jumped on the table, snatched the mace and crashed it on the head of another member. In the melee, the police already dispatched into the House of Assembly on the order of Prime-Minister Abubakar Tafawa-Balewa, threw tear-gas into the chamber as members ran for cover. That was the day the Premier, Chief Ladoke Akintola, was supposed to be replaced by another stalwart of the ruling Action Group, Chief Dauda Adegbenro. It was a Mission Impossible as Balewa later dispatched his friend and personal physician, Dr. Adekoyejo Majekodunmi, to take over the government of the West as Administrator. It was a grim prologue to the coup of January 1966 during which Balewa and Akintola, among others, lost their lives. The First Republic was the era when Nigeria was blessed with many colourful politicians. Now, politicians of colour are rare and far between and except in the dull business of sharing money, there is hardly anything to talk about politicians anymore. Gone were the days of the multi-syllabic pronouncements and jaw-breaking grammar. Yes, you may refer to the Honourable Patrick Obahiagbon of Edo State who has patented his own version of speaking in tongues, but then, he is a lone ranger whose harsh parroting cannot be compared to the creativity of the past. Of course, the most colourful politician of the old West was Chief Adegoke Adelabu, the Lion of the West. Adelabu, who had the best result ever when he graduated from Government College, Ibadan, was the indefatigable leader of the opposition National Council of Nigerian Citizen, NCNC in the old Western House of Assembly, Ibadan. Once he bought one of those big American cars and drove it to the front of Mapo Hall where the Ibadan City Council had its headquarters. The four doors of the car were flung opened and the people, Adelabu’s people, filed in from one door and exit the other side. Everyone was happy. “Has any of you ever entered Awolowo’s car before,” he asked. Ibadan has always produced its men and women of colour. During the Second Republic, the dominant Ibadan politician was Chief Busari Adelakun, alias Eruobodo (the river is never afraid). He was one of those who brought Chief Bola Ige of the Unity Party of Nigeria, UPN, to power in 1979. His formal education was minimal but over the years he had accumulated knowledge of the streets and had the rumbustious instinct of the born-general. He was a game-changer by the time he pitched his camp with the opposition National Party of Nigeria, NPN, in 1983. In the current republic we have to be thankful to Chief Olusegun Obasanjo and a few others who have brought colour into politics. Otherwise, we would have had nothing to talk about except looting, which our beloved President Goodluck Ebele Jonathan explained to us is different from stealing. In his early days as President, Chief Obasanjo visited Kogi State. One over overzealous policeman out to impress the President, in other to control the crowd, used his bilala freely. The President saw him. Obasanjo then had the policeman brought to him and he received an unprecedented presidential canning. Jonathan, dismissed as clueless by his political opponents, at least gave us an unforgettable First Lady, the incomparable Dame Patience Jonathan. We have learnt in recent months that she had a rich mother who maintained bank accounts in dollars. None of the past First Ladies could match this record, not even Maryam the Second, wife of the Goggled One. It took time to convince the First Family that the Chibok girls were indeed missing, kidnapped by the fearsome Boko Haram terrorists. Then she summoned the relevant officials from Borno State. Overwhelmed by the enormity of the crisis, she wept. “This blood you are sharing!” She wailed. She humanised the office, despite her calculated clumsiness and evident shortcomings. Now we are faced with men and women who want to be correct all the time. Alhaji Lai Mohammed, the Minister of Information, confessed to a CNN reporter that indeed Senegalese jollof rice is better than Nigerian own. It shows that apart from managing a battery of microphones, the minister is also adept at managing his taste bud when rice is involved. Aso Rock Presidential kitchen may need his services in this regards when the President resumes in the other room. However, in the current dispensation, no arm of government has shown so much creativity like the National Assembly. Gone were the days when Dino Melaye, once a famous pugilist of the House of Representatives, knew how to measure his punches. Since then, he has become the singing mascot of the Senate. No one could ignore him including those who disagree with him. It must be a welcome development for him that now he has a dancing partner from Osun State. We may not have food on our table and kidnappers and terrorists may be on the prowls, but at least we have something to laugh about. Such is the colour of this republic today that it has indeed has captured the essence of Fela Anikulapo-Kuti eternal lyrics: suffering and smiling. This article was coined by Nelson Scottfield. Well done sir! Articulate, interesting and poignant!